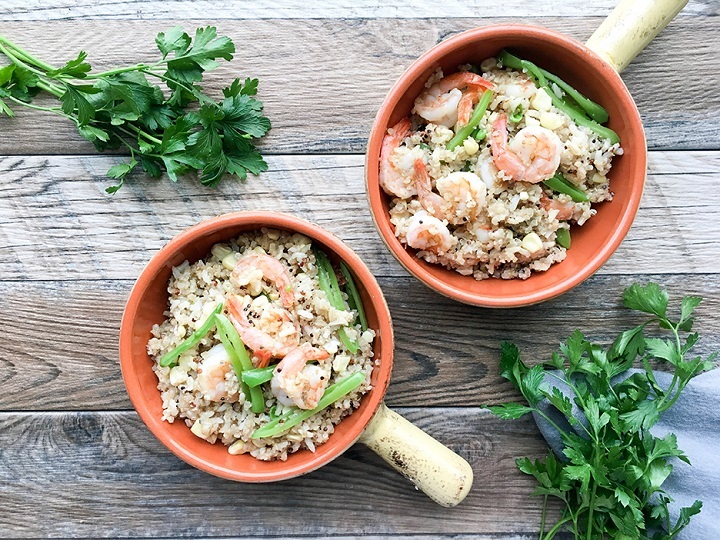 Shrimp Vegetable Quinoa Bowl – Eat your way clean to a healthier lifestyle. This bowl of deliciousness is simple and is made with fresh ingredients that your body will appreciate. Well, this past weekend I splurged a bit. I devoured my homemade chocolate chips cookies and between Saturday and Sunday 4 scones among other tasty treats. I don’t feel totally guilty as I made both the chocolate chip cookies and scones using healthier ingredients which I will share with you very soon. 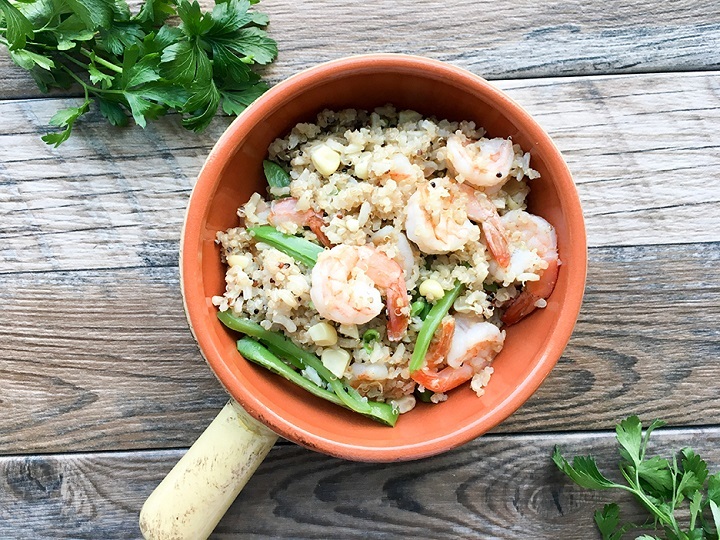 So, today, I decided to start the week off on a healthy note with this protein-rich Shrimp Vegetable Quinoa Bowl. the list goes on. This is a great dish to make when it’s time to clean out your crisper to make room for more fresh veggies which is what I did. I had fresh corn-on-the-cob and a bunch of sugar snap peas on hand that I needed to use which inspired me to make this nutritious dish for my family and me. Quinoa: For perfect quinoa, remember the 2 to 1 ratio. For every cup of quinoa, you use 2 cups of liquid. If you follow this simple tip, you will have perfect quinoa every time. Aside from quinoa being rich in protein, fiber, and other essential vitamins, it comes in three types: red, white and black. I’ve always used white and plan to try the red and black quinoa. Vegetables: The sugar snap peas were blanched. Blanching is when vegetables are placed in boiling water for a couple of minutes and then submerged in an ice bath to stop the cooking process. After the sugar snap peas were placed in the ice bath, the corn-on-the-cob was placed in the same boiling water until the corn was tender. Shrimp: The shrimp were boiled in the same water that was used for the sugar snap peas and corn and was only boiled for a few minutes to prevent overcooking and rubbery shrimp. 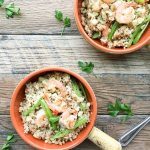 This Shrimp Vegetable Quinoa Bowl is perfect as a side dish, lunch, or dinner. It’s healthy, budget friendly, and cleanup is minimal – YESSSSSSSS!!! If quinoa is your thing, check out Turkey Quinoa Stuffed Bell Peppers and Quinoa Roasted Corn Salad. Quinoa does not have to be boring. If you love quinoa, get creative by building a nutritious quinoa bowl with shrimp and your favorite veggies. Use quinoa as your base and build from there. Prepare quinoa according to directions. Tip: 2 cups of water for every cup of quinoa. Set aside. In a separate pot, boiling about 4 - 5 cups of water. Note: Add enough water to cover corn-on-the-cob. Add the sugar snap peas to the boiling water that does not contain the quinoa for 2-3 minutes. Immediately place in ice bath. Pat dry with paper towel, slice thinly. Set aside. Place a saute pan over medium heat. Add olive olive. When olive oil is heated add cooked quinoa, corn, shrimp, a drizzle of olive over the top, salt (to taste) and toss. Then add, sliced sugar snap peas and gently toss again.